I see fall nearing us and so before it completely arrives ,let us enjoy the summer to the fullest with beach trips.Are you in ? ?I had some white terry towels(Bath towels) laying around the house and so I thought I would make a try dying them.I really enjoyed my first experience of dying my shoes, if you missed that post,click here.Now to my second try, tie & dye is one the popular method of dying fabrics and I wanted to try them in terry towels.Have anybody thought about dying terry towels ? ?Or am I the only person to do it ? ?Answer me in the comments and now to the DIY. 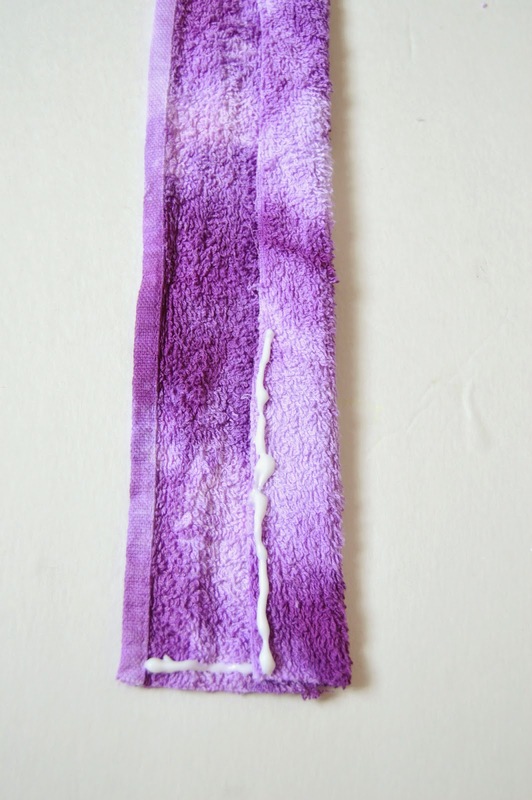 Sample fabric to test the dye colour. 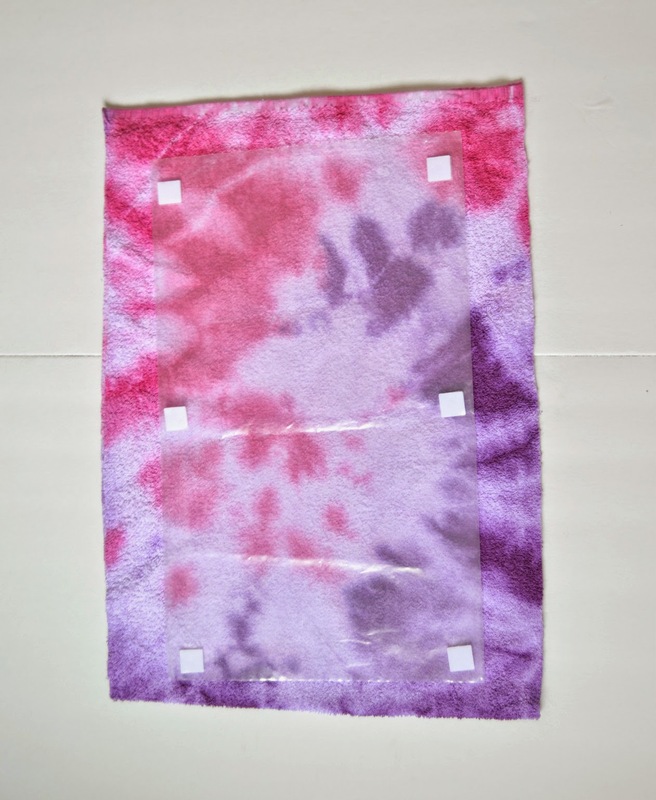 Step 1: Prepare the towel for tie & dye.Fold the towel into half size.Keep your forefinger and middle finger in the center and twist it so that the towel twists. 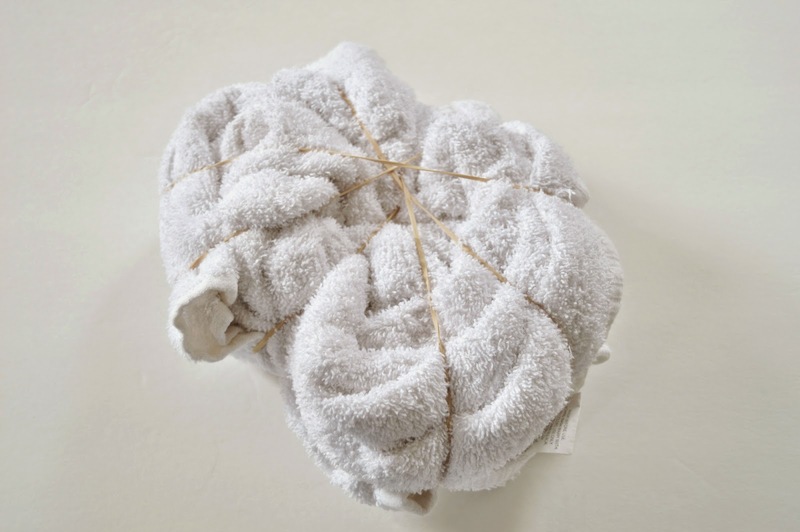 (As shown).Just fold the remaining in the shape and lock it with the rubber bands.Wet the towel in water. Step 2: Fill half of the container with warm water and 2 tablespoons of salt. 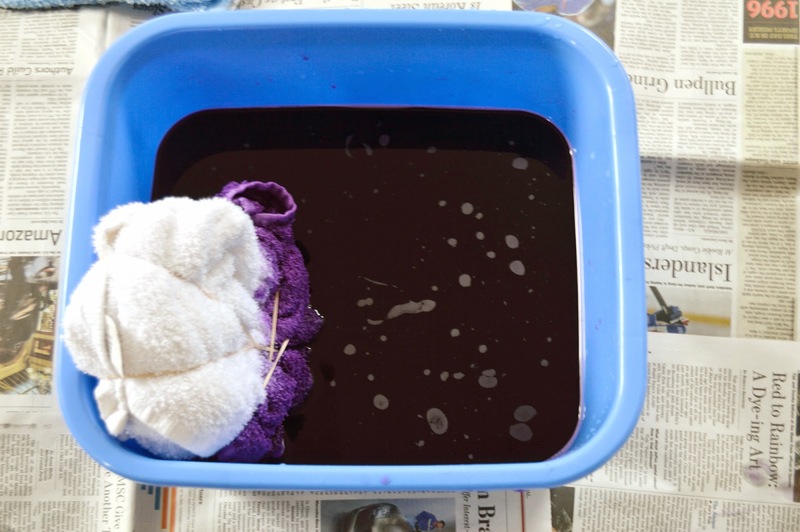 (Mix well and add small amount of dye in the starting stage, mix well again.Now, take the sample piece and dip it inside the dye bath.Take out to check whether the color is okay for you.If you feel it is lighter ,then you can add more dye.Immerse one half of the towel into bath and let it sit for 20 minutes. 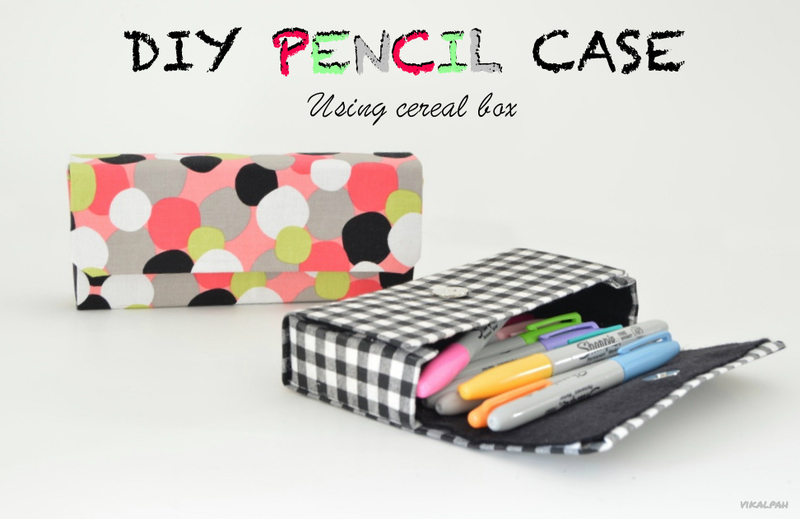 (Refer the package for complete instructions). 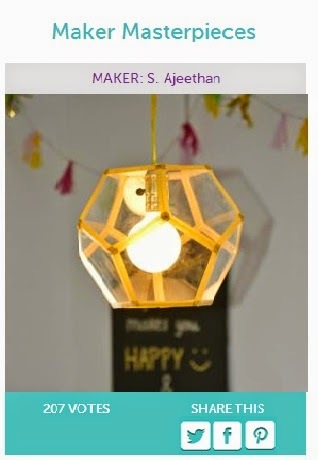 Note: Before dying ,think for a minute whether you have any other pieces in your house needs dye makeover.May be some beautiful light colour table runners or some sentimental pieces you have saved as it got small stains.Take them out and give a new life to them. 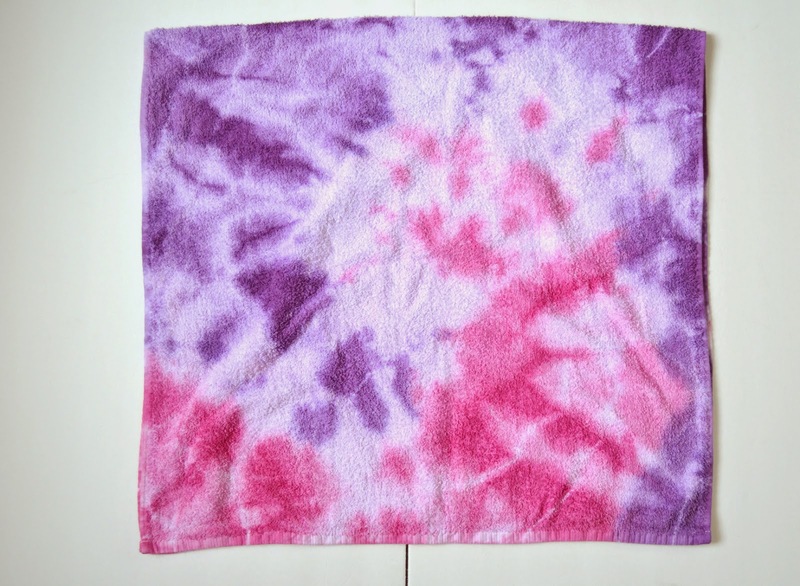 My light coloured kitchen towel had some brown stains and so I dyed them to purple and pink .And now I have a beautiful double colored kitchen towel :).Why to waste the remaining dye when we can use it for many other things to dye ;)? 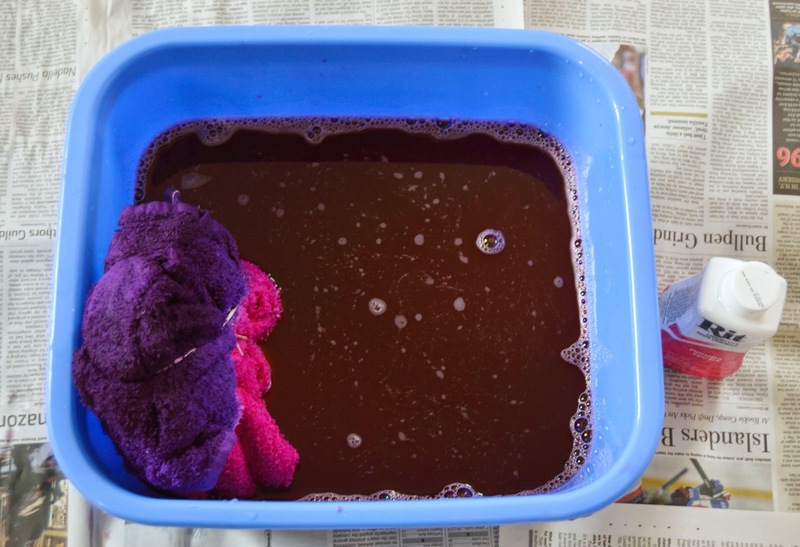 Step 3: Repeat step 2 to make dye bath for another color and dye the other part of the towel.You can try using more than 2 colors to make it more colorful. Step 4: Take them out and carefully rinse them in warm water, then in cool water until water runs clear. 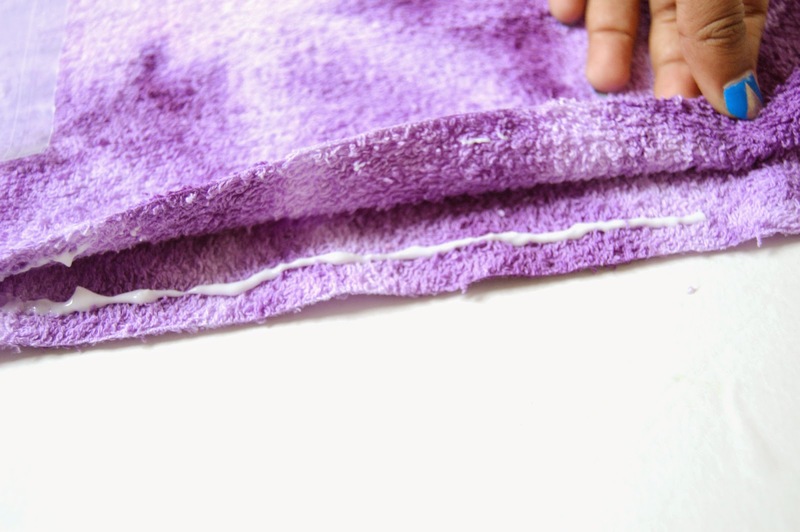 (Warm water helps to rinse the residual dye in the surface effectively).Allow them to dry completely. Here it is after the dying process. Step 5: Now its time to make the bag.You can use the towel as such or trim it to the required size.I trimmed the sides of the bag to about 4 inch each side.Before sewing or gluing the sides, I thought the beach bag would be perfect if it has some compartments for shoes and other miscellaneous items such as sun glasses,sunscreens,etc instead of just throwing in everything. So, I attached one large plastic bag on one side for shoes or flip flops and a small one on other side for miscellaneous items.I did this with velcro as it will be easier to clean the bags and put them again.But it is all based on your personal preferences.I wanted it to be clear compartments as it will be easier to see what things are there but you can make them with same fabric and sewing them instead of using Velcro.However I used a ordinary a velcro sticky back , I recommend you to use Velcro fabric fusion as that will be perfect for fabrics compared to ordinary one. Step 6: Use fabric glue or sewing machine to complete the sides of the bag.Use the remaining fabric to make handles for the bag.Use 3 inch width for the handle and sew or glue them by folding it as shown.Length of the bag can be according to your preference.Use needle & thread to sew the handles or sew them if you have sewing machine.I used simple stitches and hand sewed them.Voila!! 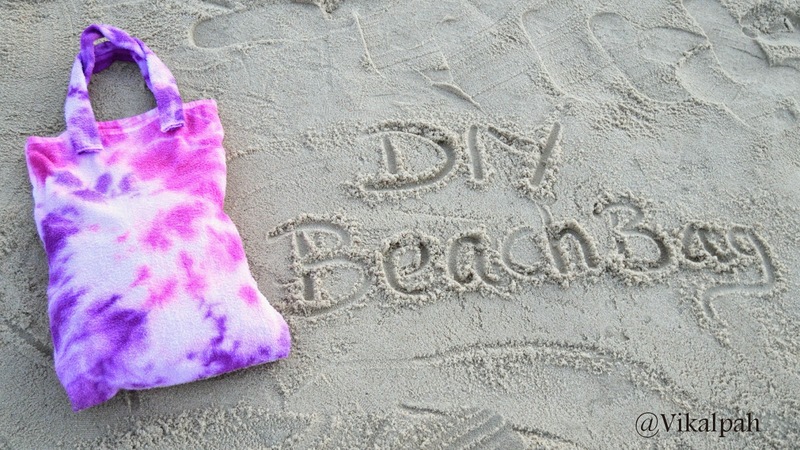 !Now you have a beautiful bag to rock your beach trip!!! And here is the final reveal of the beach bag ....I am enjoying the beach with my new beach bag.When are you going to make one ?? 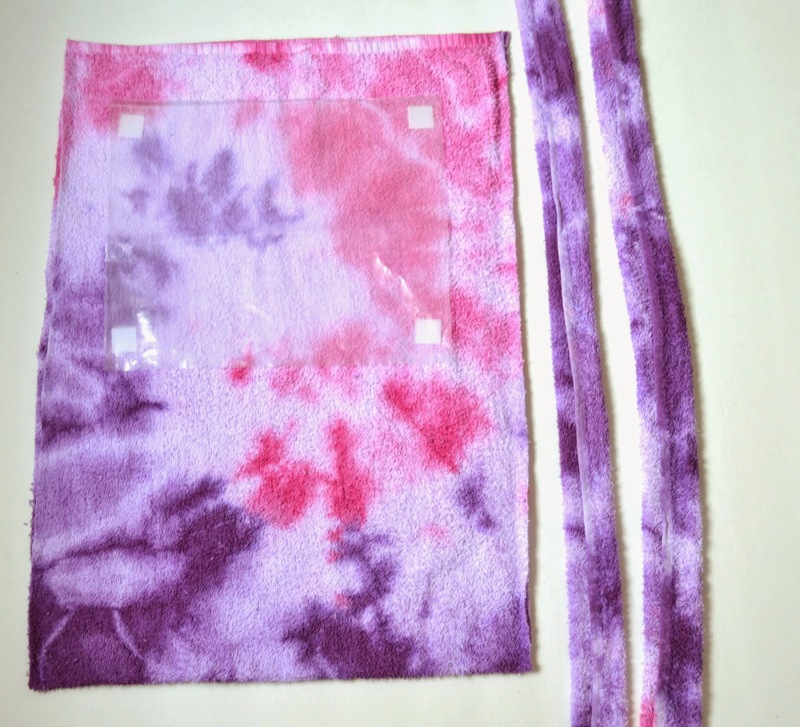 Here are my two dye projects so far. What do you think about this beach bag ? 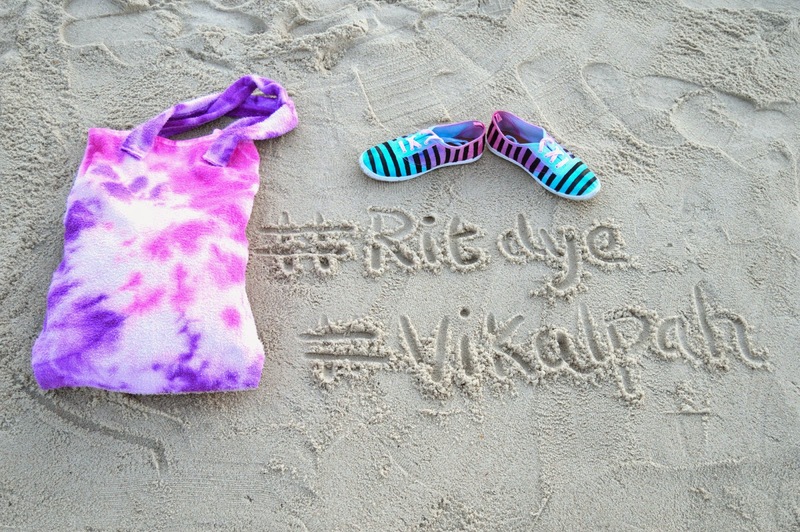 ?Feel free to share your comments below or write to vikalpah@gmail.com. I loved those shoes! And this bag is cool, too! 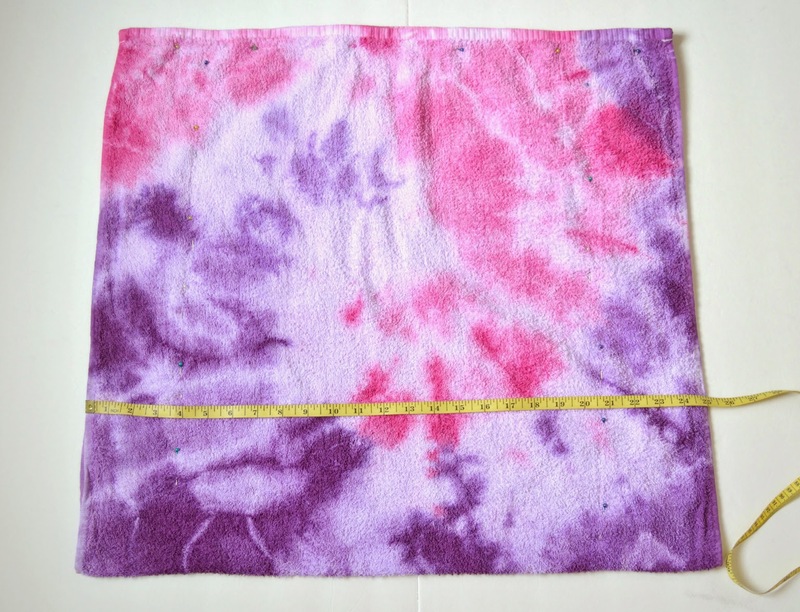 I haven't tie-dyed something in a while...I need to try it! Nice tut. Love the bag... looks like fun. super ! 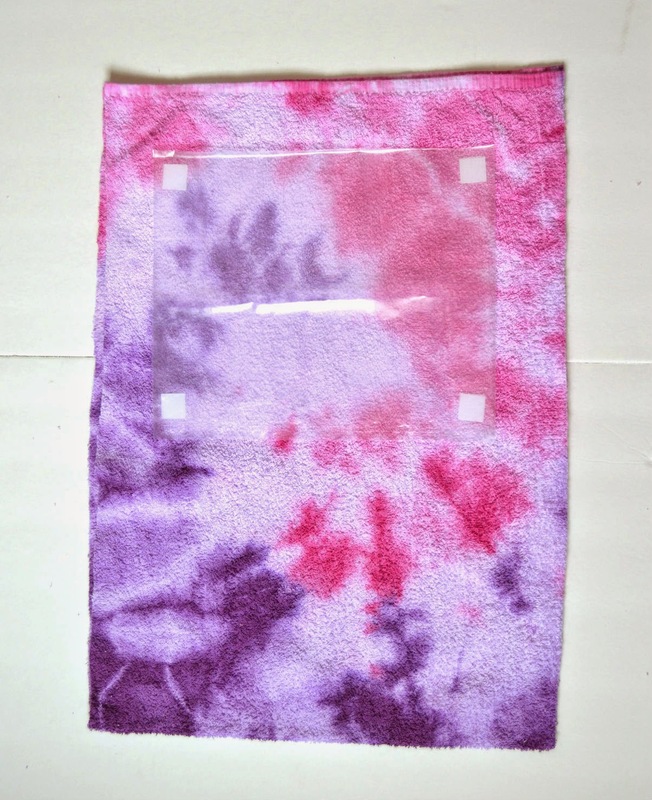 reminds me about cotton sarees I used to wear in tie and dye type, very pleasant colors! 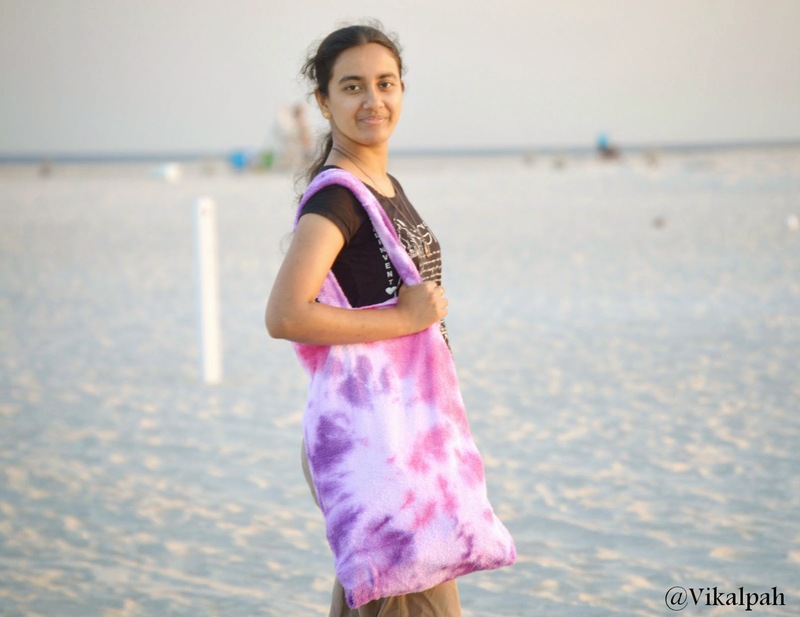 Amazing beach bag! Love it! 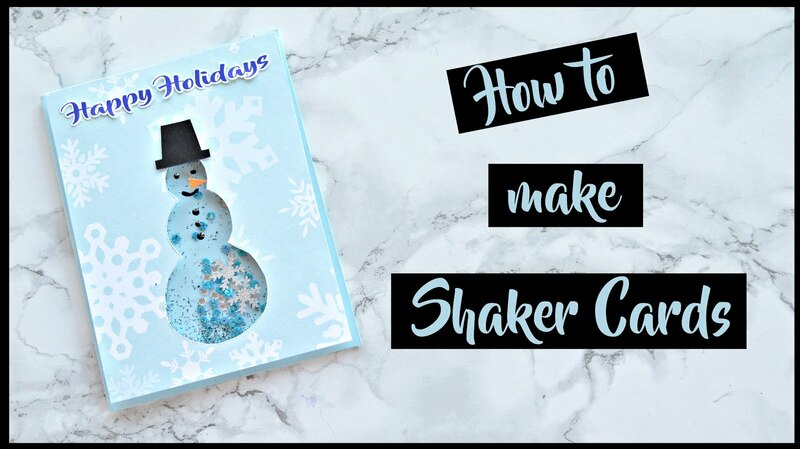 Thanks for sharing great tutorial! Hope you have a wonderful day! 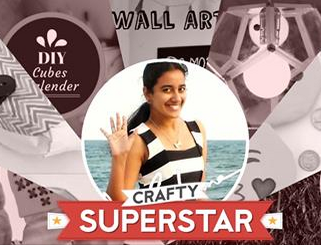 I share all things crafty to satisfy your creative cravings. 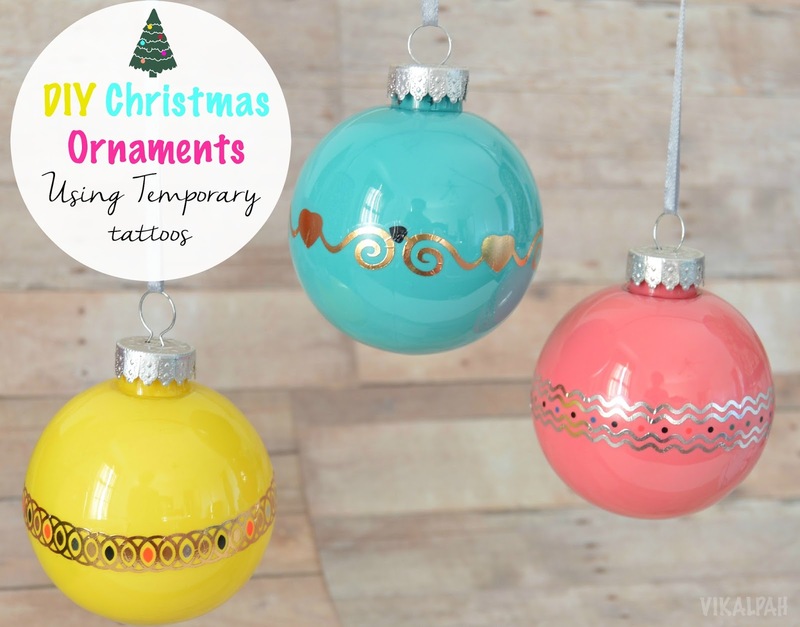 Read more..
Get creative ideas right into your inbox! 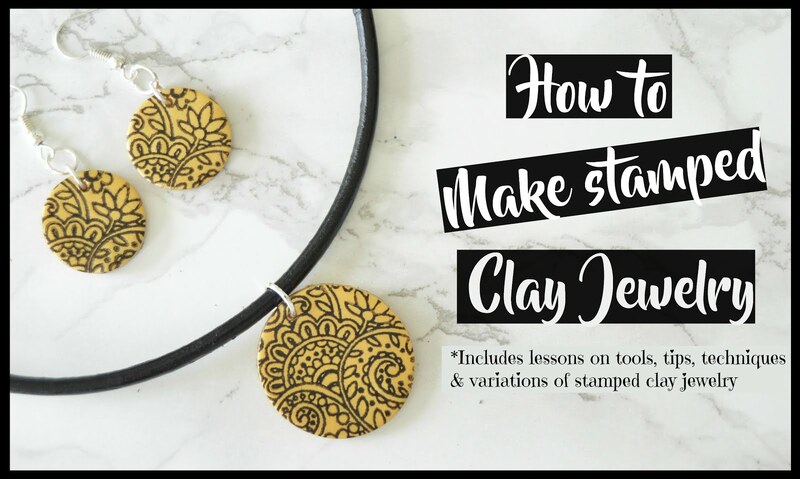 Check out my classes on Skillshare! Check out my Interview on Cutout + Keep! !